Whomp whomp. 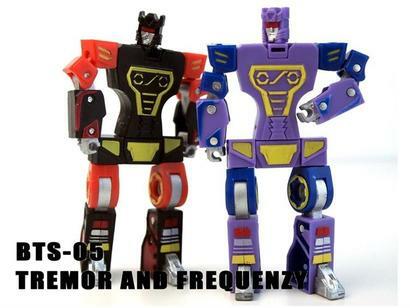 There're no BTS Minions Set A Tremor and Frequenzies for sale. These were released as the Cassettrons Frenzy and Rumble. These figures are built well, very solid and are heavy as they contain real die-cast. In print or video their design doesn't look as appealing as they do in person. The transformation is, in my opinion intuitive. Robot mode has plenty of articulation. The color scheme is unique however causes a problem in 'alt mode' as these faux cassettes look nothing like cassettes besides having 2 holes. These are very different from any official version of the character which is a good thing. The functionality of the pile drivers is not the best. All in all these are a great buy, even without Sonicron.